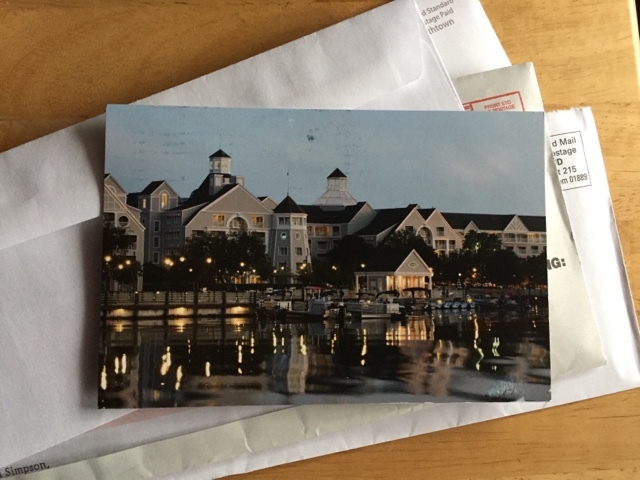 With our ever-growing penchant for instant communication- messaging, texting, photosharing, email and social media posts- the time-honored tradition of the vacation postcard might just be in jeopardy. The act of selecting a postcard, then writing, stamping, and sending it- seems to have fallen out of fashion. Let's not allow postcards to fall by the wayside! Who doesn't love getting a postcard in the mail? Disney makes it easy to revisit this old school vacation mainstay. 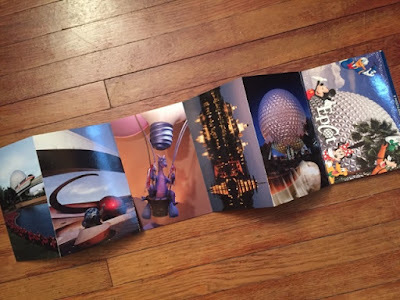 Postcards can be found in almost any gift shop, at both parks and resorts. There's usually a selection of individual cards, as well as sets in booklet form, like the Epcot example below. Forgot to include stamps on your packing list? Never fear- you can buy stamps right at the register in most places that sell postcards. You'll also find mailboxes in each park and resort. The mailbox below is in the Beach Club lobby, right next to Bell Services. ...and it arrived at its destination with Tuesday's mail, after its 1200+ mile journey.